International Management Resorts LLC, which runs the Trump International Beach Resort in Miami, also received 59 total worker visas for waiters, maids and dining room attendants last year. 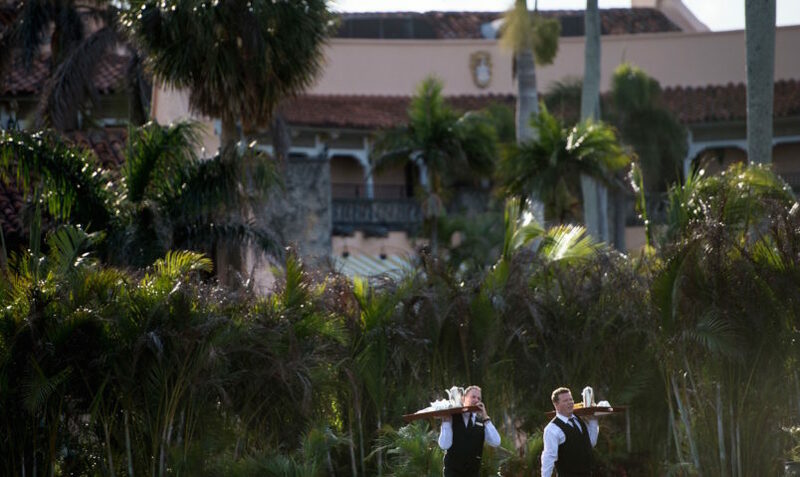 Trump National Golf Club in New York got 14 visas for cooks and waiters, the company that manages Trump National Golf Club in Jupiter, Florida, received 12 visas for waiters and cooks, and Trump Vineyard Estates got 29 visas for agricultural workers. The 192 total approved visas appears to be the highest number the Trump Organization has obtained through various visa programs going back at least a decade, and are dramatically higher than many other years in the Trump Organization’s history. The company received an average of 116 visas per year in the decade prior to 2018, according to the available data collected by American Bridge. The company’s previous high number of visas appears to be 178 in 2016, Trump’s first year in office. The organization’s properties don’t appear to have received more than 143 visas in any other year going back at least to 2009. The Trump Organization has applied for at least 1,692 foreign worker visas and received at least 1,650 between 2001 and 2018, according to the data. More than half of those were for Mar-a-Lago. Charles Kuck, an Atlanta-based immigration attorney who teaches at Emory University, said that the Trump Organization’s heavy reliance on the visa programs flies in the face of the president’s political rhetoric and actions. The numbers are a bit spottier from 2001 through 2007, the other years that data are publicly available. In those years the data are maintained by a program run through the state of Utah that has contracted with the Department of Labor, and in the years 2001 and 2007 the data are only partially accessible. 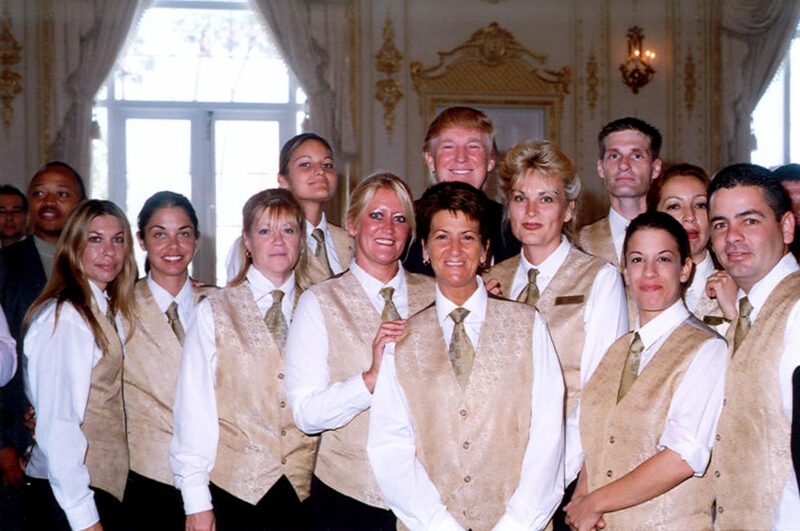 But the available data strongly suggest that the Trump Organization’s heavy use of H2A and H2B visas didn’t begin until 2006, when Mar-a-Lago started hiring foreign temporary workers. Before that, it appears that the only part of the Trump empire that used visas as a regular part of its operation was the Trump Model Management Group, which used H1B visas meant for highly skilled workers to bring in foreign models. That means that the 192 visas the Trump Organization received in 2018 likely represent the largest number they received in the last 18 years. The White House declined to discuss the apparent spike in foreign worker hiring or answer whether the president supported his family company’s increased use of the visas. “You need to contact Trump Org,” White House Press Secretary Sarah Huckabee Sanders told TPM in an email. Multiple people at the Trump Organization didn’t respond to repeated emails asking if they disputed the numbers compiled by American Bridge and requesting comment on the apparent increase. Trump owned and operated the Trump Organization from its creation until shortly before he was sworn in as president, when he handed the reins over to his two eldest sons, Eric and Don Jr., but retained his ownership interest. That’s far from the complete divestment that most prior presidents have undergone to avoid conflicts of interest, but it’s unlikely he’s making day-to-day management decisions at the company like visa requests. Trump still regularly visits the company’s many properties. Besides his frequent trips to Mar-a-Lago in the winter and the company’s Bedminster, New Jersey property in the summer, he makes a point to regularly dine out at the Trump hotel in the old U.S. Post Office building just down the street from the White House, while frequently golfing at the Trump National Golf Club in northern Virginia. Trump has repeatedly defended hiring foreign labor at his own properties, even as he’s criticized other companies for not hiring more American workers. Trump’s properties have also reportedly repeatedly hired undocumented workers, and the New Jersey prosecutors and the FBI have reportedly collected evidence that supervisors at Trump’s Bedminster golf club gave undocumented immigrants fake legal documents so they could work there. Trump has made his political career railing against immigrants. The ongoing partial government shutdown over his demand for funding for a U.S.-Mexico border wall is just the latest example of his hardline views. He’s been notably less hostile to the types of temporary worker programs his companies rely on, however. Trump and his allies both inside and outside the White House have actually talked about expanding business-friendly low-skilled temporary worker programs at times, though in practice the administration has been a lot more skeptical of those programs. During a Monday speech to the American Farm Bureau Federation, Trump suggested he’d make it easier for employers to hire foreign seasonal workers even as he raged about undocumented immigrants entering the country. “A lot of people don’t understand this. You need people to help you with the farms. I’m not going to rule that out,” he said. The restrictive immigration bill authored by Sens. Tom Cotton (R-AR) and David Perdue (R-GA) that Trump endorsed notably didn’t touch the programs that Trump’s family companies rely on, even as the bill took an axe to many other parts of the system. While Trump has been far less critical of work visa programs than other aspects of the immigration system, some of his top aides and allies have been much more hostile to the programs and worked to undercut them. In late 2016, shortly after Trump’s election, the GOP-controlled Congress eliminated a rule that exempted most workers who’d received those visas at the end of 2016 from counting towards the annual legal cap of 66,000 H2B visas, a move which lowered the total number of those authorized visas by at least half. Congress later authorized the Trump administration to issue as many as 70,000 more visas annually in an attempt to fix this problem. When Sen. Lisa Murkowski (R-AK) pushed then-Department of Homeland Security Secretary John Kelly to authorize those visas during a Senate hearing, he fired back. “For every senator or congressman who has your view, I have another who says, ‘Don’t you dare. This is about American jobs,'” he said. Kelly and the DHS ended up authorizing 15,000 more H2B visas above the annual cap of 66,000 in both 2017 and 2018. That was more than some hardline anti-immigration groups wanted, but didn’t come close to meeting demand from companies who were used to getting workers and were suddenly left in the lurch the last two years in a tight job market driven by the strong economy. The Trump administration also wreaked havoc on the companies who rely on H2B visas by changing the program from first come, first serve to a lottery system, hurting industries from landscaping to crab-picking that rely on predictability in the visas program. This year, there was such a rush to get in H2B visa requests as soon as the calendar turned to 2019 that the Department of Labor’s application website crashed at midnight on New Year’s Day and stayed down for days. And in September, the Department of Labor announced it would be cracking down on the H2B program by ramping up investigations of hotels using the program. The Trump Organization appears to have received every H2A and H2B visa it requested in 2018. It also appears that the company has received more than 90 percent of the visas it requested every year in the last decade, though it’s hard to be certain: The percentage of annual approved visas is an approximation in three of the past 18 years, as the Department of Labor didn’t include the number of requested visas for four companies in 2013 and one company in 2008 and 2009. There are few other potential caveats on the numbers. The statistics include data from two dozen current and former limited liability companies and other companies that were part of the Trump Organization from 2001 through 2018, including all that Trump listed in his own personal financial disclosure forms in recent years, and American Bridge’s researcher checked for other related companies listed at the same addresses as the known companies. The data include all of the Trump Organization’s other publicly known properties including now-defunct ones like Trump’s modeling agency and his Atlantic City hotels. But there’s a chance that the search is not totally comprehensive and some now-defunct companies that weren’t on Trump’s personal financial disclosure form might not have been included, which could potentially lead to undercounts in some earlier years. In a few years, the visas the company received came for the same types of employees for the summer and winter request periods, meaning that some employees may have needed two separate visas to work for a year and the total count of visas is higher than the actual number of foreign workers the Trump Organization employed. Kuck, the immigration attorney, said that the high percentage of approval rates the Trump Organization got on its visas aren’t unusual for a larger company that has received temporary worker visas in past years. He said the real interesting data will be from the last H2B application period, during the program’s recent struggles. “They get 100 percent this year, then either they’re really lucky and they have great lawyers or there is something bad going on,” Kuck said.